Classic beachfront location on quiet, lush and tropical Aliomanu Bay. RIGHT ON THE BEACH! Swimming and snorkeling on-site. 3 bedroom beachfront cottage sleeps up to 8 guests. All rooms have a wonderful view of the whitewater ocean! 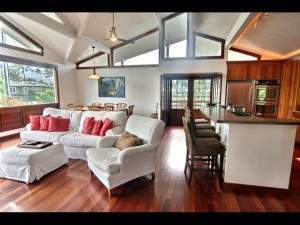 This casual Hawaiian cottage has 2 ocean view beachfront lanais, both upstairs and downstairs. Both are covered and have lanai furniture and tables for relaxing. You may spend all of your time outside staring at the ocean, enjoying your morning coffee, family and friends. One bedroom upstairs with queen bed with direct lanai access. There is also a queen futon in the upstairs living area. 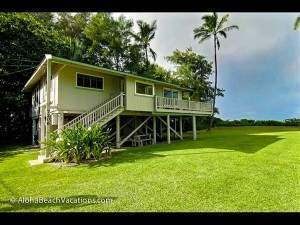 The upstairs has the ocean view living area, kitchen, and dining room with lanai access. The ocean level downstairs has two bedrooms both with lanai beachfront access. One has a king bed & the second downstairs bedroom with queen and full size bed. The ocean in front of the home there is a barrier reef with swimming and snorkeling in the turquoise waters. Ocean waves for surfing, boogie boarding, body surfing are about 1/2 mile down the beach. Incredible Location! We can help you with discounts on car rental, and adventures on Kauai. Enjoy KAUAI @ KAUAI BLISS!